The more I use DEVONThink to organize my research, the more my little Macbook Pro (2.4Ghz, 8GB RAM) gets bound up in running OCR jobs on my archival images. There are commercial options for this sort of thing, but I don’t have an industrial-scale budget. DEVONThink uses AABBYY FineReader’s OCR libraries under the hood. If AABBYY would license a command-line version cheaply that I could install in my home directory on a university server, I’d consider doing that. In the open-source world, OCRopus does most of this, but it takes images as input and produces HTML output, not OCRed PDFs. (I mean, I guess that would work, but many of my images don’t OCR cleanly enough for me to be able to use HTML output for research without also looking at the source image. I use OCR as a rough-and-ready indexing strategy.) pyocrhelper will take PDFs as input, but it converts them back to images first, which is a waste of processor. Protovis can do all kinds of things, but I was particularly taken with the choropleth map example, which bears a striking resemblance to a problem I’ve been wanting to work up a visualization for. It took a while to figure out how to adapt their example to the data I’ve got, but here’s what I ended up with. This image is for 1921. 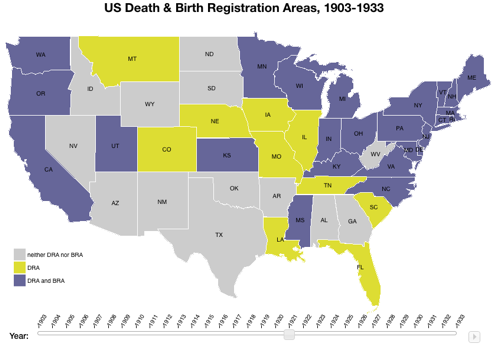 Gray states didn’t meet the federal standards for birth registration or death registration; yellow states registered deaths well; purple states registered births and deaths well. You can click on the image for an interactive version that’ll let you set what year to examine. Want to do this yourself? For those of you who have a similar research problem that might be able to use some visualization, I’ve posted the code on GitHub. You don’t need a web server to run it; all you’ll need is to modify the data file with your own state-level data. If you change the names of any variables in that file, you’ll need to search-and-replace them in the main page’s scripts as well. Yesterday, Digital Humanities Answers helped me find an answer to a problem I’ve been wondering about for a long time: how to map some data easily, without having to know a lot about GIS. A promising bit of OCR software seems like more trouble than it’s worth, at least on OS X. Now that summer is well underway, many historians are deeply ensconced in archival research. Some of us, particularly the newly-ABD, are looking at our digital cameras and carts full of Hollinger boxes and wondering how to make sense of it all. The first step is being able to find an image reliably, and that requires good file naming practices. This is where I write about my research in progress, with an emphasis on the experimental work I'm doing with digital tools. I'm inspired by Jeremy Boggs' call for humanities scholars to write more about our digital tools and research practices. I post here rather than at my main blog so that I can go into technical details without chasing off general readers. If there's a topic you'd like to know more about or if you'd like to write a guest post, please catch me on Twitter or email srl at thisdomainname dot org. CPAN author directory Perl code, mostly old (pre-2001). me at GitHub code I’m working on. my Zotero library Stuff I’ve read or cited (or want to). History Research Hacks, © 2010 Shane Landrum. Some Rights Reserved.